Lord Ukyo announces to his wife that he will hold a Zen-prayer session, locking himself in a pavilion overnight. But the truth is that he wants to sneak out to see a woman he encountered on his recent trip. A love affair is fun, and a little cheating would not cause too much harm. As a substitute, a poor servant is forced to stay in the prayer pavilion in place of the lord. 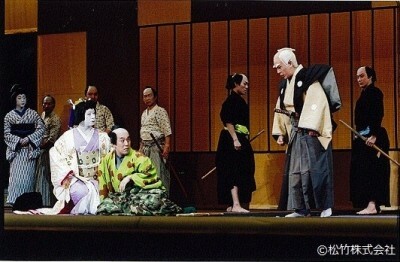 Although the lord’s wife is not supposed to visit her husband out of respect for his isolation, she is so monstrously affectionate that she breaks her promise… A simple domestic farce is elevated to an expression of the joyful energy of life by two of the best dancers of the Kabuki world, Kanzaburo and Mitsugoro. Contemporary playwright/director Hideki Noda updated this Kabuki play by loading it with irony and criticism of today’s society. Tatsuji is a sword-sharpener from the commoner class who was recently accepted to samurai rank. His “successful” rise in the hierarchy was merely the result of his clever verbal tactics and materialistic values. He blames his own failures on others, shows no respect for the noble philosophy of the samurai, and impertinently flatters the lady of the house. Somehow, he happens to become caught in a situation in which he is hunted by two brothers avenging their father’s death. The gigantic revolving stage represents the hilarious chase across Japan. In the play, the common people display their hunger for an honourable hero who will amuse them. The avengers are as reluctant as Tatsuji, who is entirely exhausted by continually escaping from them. Isn’t the revenge simply a murder? What is all this killing for? 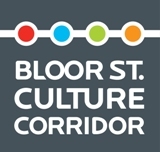 Visual quotations from global culture, such as baseball and West Side Story, sparklingly decorate the piece on the surface, yet dark questions still lie just underneath. For the late Kanzaburo XVIII “Lion Dance” was the most precious gem of his family tradition. Danjuro IX, who created the piece, was the mentor of Kanzaburo’s grandfather, Kikugoro VI. 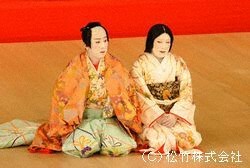 Four generations of the best Kabuki actors of their eras nurtured “Kagami Jishi” and developed it into one of the best examples of the dance repertoire in Kabuki theatre. A single dancer conjures up a stunning contrast of two images: A young maiden in the Shogun’s castle is transformed by the spirit of the majestic Shishi, a mythical animal. The healthy, sophisticated eroticism of a young woman is described by the dancer in the first part. She is noble, sensitive, yet coquettish at times. But, when the spirit of the ferocious Shishi takes over her body, the animal stamps the earth, and swings his mane in the air, celebrating the prosperity and glory of life. The Japan Cultural Association commissioned this theatrical documentary to introduce Japanese culture abroad. The scenes were shot in 1935 and 1936. Two masters crowned this precious cultural legacy: Kabuki actor Kikugoro VI and filmmaker Yasujiro Ozu. The genius of the dancing talent of Kikugoro was captured by Ozu, so free in form and full of spontaneity. Kagamijishi is Mt. Everest for Kabuki actors to challenge, and all contemporary performers study this film so closely when they are assigned to dance this piece. So did Kanzaburo XVIII, the only grandson of Kikugoro VI. On the main street of the Yoshiwara pleasure district the top courtesan Yatsuhashi makes a luxurious procession through the fully blooming cherry trees. 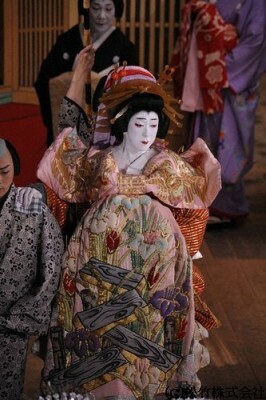 Miraculously, she happens to smile at Jirozaemon, a country merchant in the crowd. Who would have ever imagined that this momentary encounter could be the cause of a mass murder? A love triangle forces the courtesan to reject her best customer in the middle of a banquet — the most dishonourable humiliation of all. Jirozaemon seizes the haunted sword Kagotsurube, which inevitably invites bloodshed once it is drawn. 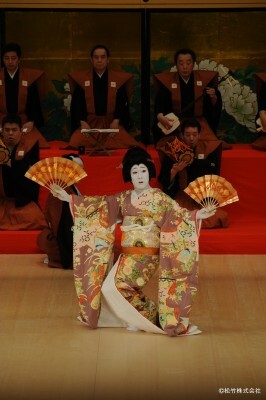 Kanzaburo and Tamasaburo are joined by Nizaemon to form a dream cast for this Kabuki classic.